San Diego, CA – January 2, 2018 – Competitor Group, Inc. (CGI), operators of the Rock ‘n’ Roll Marathon Series, today announced that Synchrony Financial (NYSE: SYF), one of the nation’s premier consumer financial services companies, will become the new title partner for the 15th annual Rock ‘n’ Roll Arizona Marathon & ½ Marathon, which returns January 12-14, 2018. In addition to renewing as a Series Partner in 2018, Synchrony Financial also signed on for the second consecutive year as a title partner for the Synchrony Financial Rock ‘n’ Roll San Diego Marathon & ½ Marathon, which will take place on June 2-3, 2018. Synchrony Financial will have employee teams running in each title market. The fast and scenic courses will give runners a first-class tour of the desert cities of Phoenix, Scottsdale and Tempe. Runners can rock to the sounds of live, local bands, along with enthusiastic cheerleaders to keep participants moving. The event concludes with a post-race concert and finish line festival. New in 2018, Synchrony Financial Rock ‘n’ Roll Arizona is adding a 1 Mile race Friday night before the event, kicking off a weekend of fun and fitness. For more information about Synchrony Financial Rock ‘n’ Roll Arizona or to register for the event, please visit RunRocknRoll.com/Arizona. * Source: The Nilson Report (June 2017, Issue # 1112) – based on 2016 data. 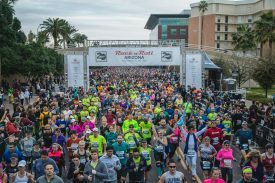 The 15th annual Synchrony Financial Rock ‘n’ Roll Arizona Marathon & ½ Marathon will take place the weekend of January 12 – 14, 2018. The fast and scenic courses will give runners a first-class tour of the desert cities of Phoenix, Scottsdale and Tempe. Runners can rock to the sounds of live, local bands, along with enthusiastic cheerleaders to keep participants moving. The event concludes with a post-race concert and finish line festival. A two-day Health & Fitness Expo kicks off race weekend at the Phoenix Convention Center on Friday, January 12 and Saturday, January 13. The Expo will have numerous vendors featuring the latest in running gear, nutrition and training tips. To register for the race or for more information, visit RunRocknRoll.com/Arizona or follow us on Twitter @RunRocknRoll. The 21st annual Synchrony Financial Rock ‘n’ Roll San Diego Marathon & ½ Marathon will run through San Diego over the weekend of June 2-3, 2018. The race is known for lining the course with live bands and cheerleaders interspersed with themed water stations along each mile of the route. Runners and spectators can celebrate their accomplishments at the Toyota Rock ‘n’ Roll Concert Series in Waterfront Park. The original Rock ‘n’ Roll Marathon in 1998 is still recognized as the largest inaugural marathon in U.S. history with 19,979 entrants. A free two-day Health & Fitness Expo at the San Diego Convention Center kicks off race weekend, featuring more than 80 fitness retailers, exhibits, free samples and interactive clinics. The event concludes Sunday afternoon with the Toyota Rock ‘n’ Roll Marathon Series Headliner Concert. Over the 20-year history of the race, runners have raised more than $320 million for charities. For more information about the Synchrony Financial Rock ‘n’ Roll San Diego, please visit RunRocknRoll.com.